Sean Connery never played golf before so he had took lessons so that when it came to filming he could at least appear to be the proficient golfer Bond was supposed to be. Quite by chance, he discovered he had a natural aptitude for the game. This sparked a lifelong love of the game for Connery and he would go on to play at every available opportunity. In fact, so passionate was he about the game that he would compare golf to his religion in his biography. He also continued to wear the classic Slazenger v-neck sweaters in which his Bond had first played golf, with a light grey marl being a favoured colour. 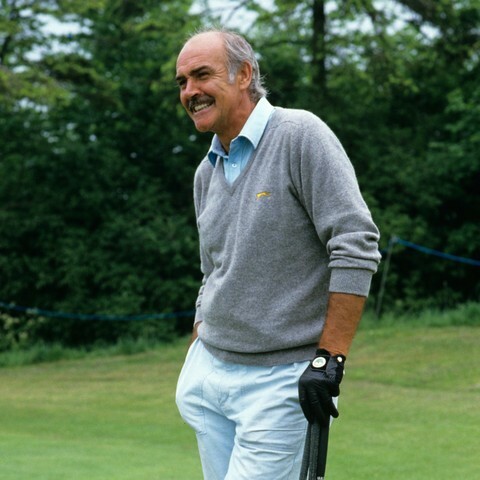 It was the real world legend of Sean Connery playing golf in his grey marl Slazenger, rather than just the fictional character of James Bond, that prompted Anthony Sinclair & Slazenger Heritage to examine the other golfing legends who had worn the Slazenger v-neck, so we started exploring deply who and when wore the slazenger jumpers. As mentioned, The logo itself was one of the most difficult aspects to achieve. After examining hundreds of screenshots, sourcing original period sweaters, and scouring the Slazenger archive for original artwork, the exact logo used on the “Goldfinger” sweater was finally identified. Therefore, the panther used in the Bond Jumper looks slightly diferent from the other golf legend jumpers. For this reason the burgundy jumper holds the vintage panther logo as the original had done in 1963. The rest of the jumpers do hold the posterior panther logo from the seventies and eighties.